I had the real pleasure of custom quilting this very HAPPY Quilt! 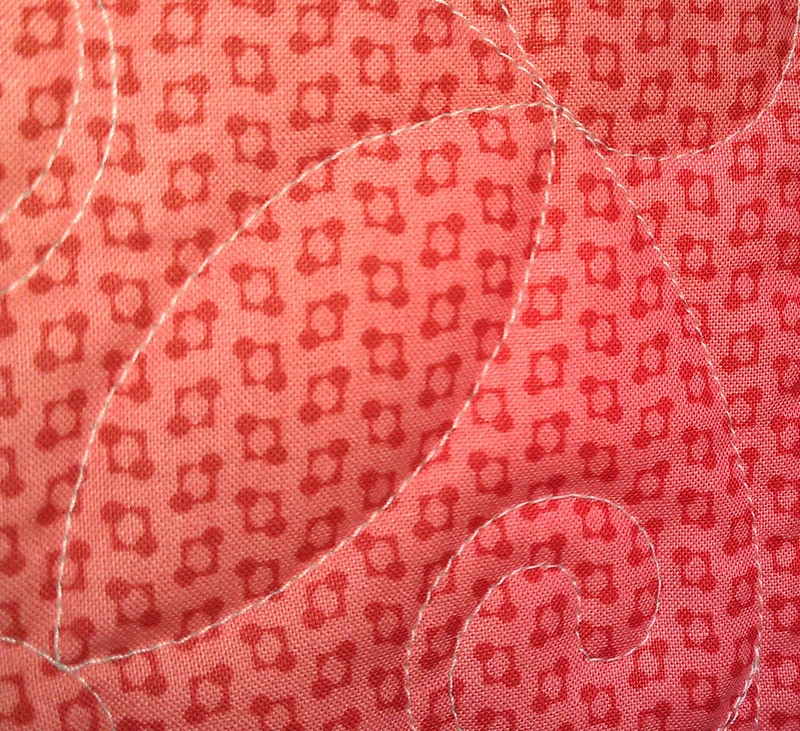 It contained such bright, fun fabrics that a person couldn’t help but smile when they looked at it. 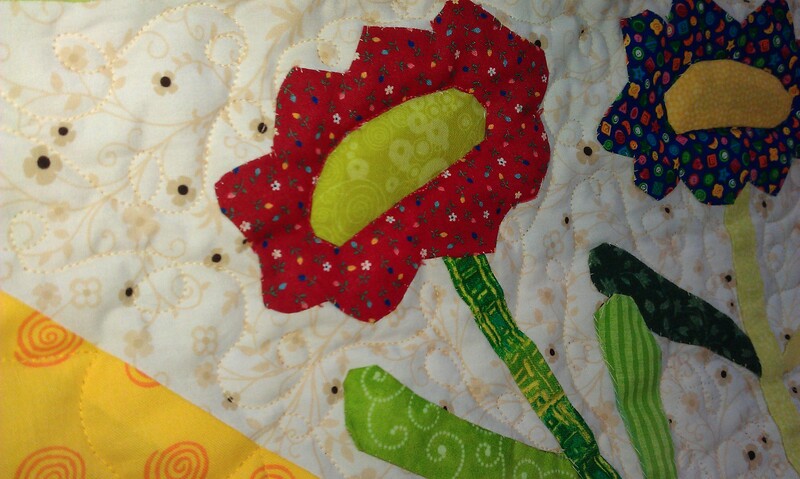 The borders were quilted with a pattern that resembled the appliqued, oval flowers. 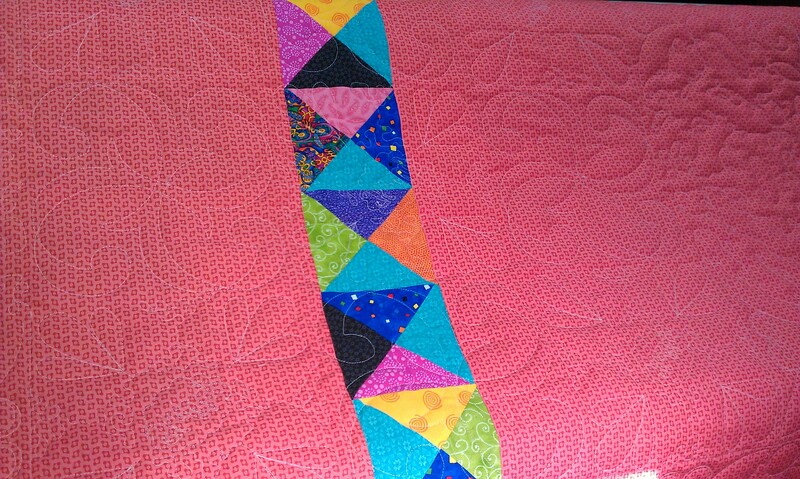 The Ohio Star quilt blocks were treated to a ‘triangle tri-lobe’ pattern and free hand meandering in the white backgrounds. The recipient’s name was stitched into the center of the block. 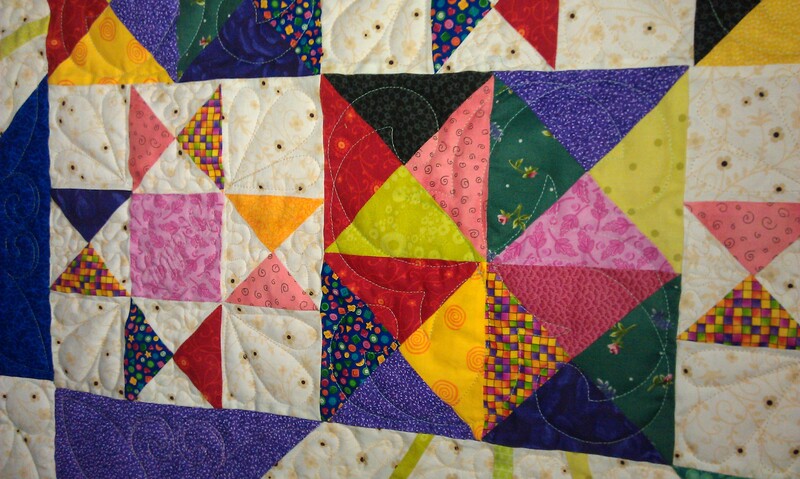 The colorful bowties were not quilted so that they ‘popped up’. 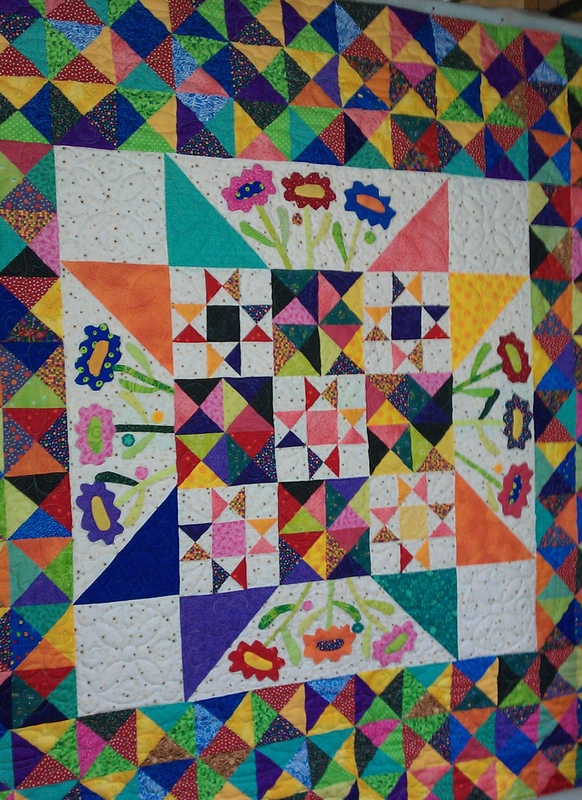 The nine inch quarter square triangles received a ‘whirligig’ quilt pattern. A ‘graceful vine’ quilting pattern was placed in the light color squares and a matching triangle pattern was placed in the large triangles. 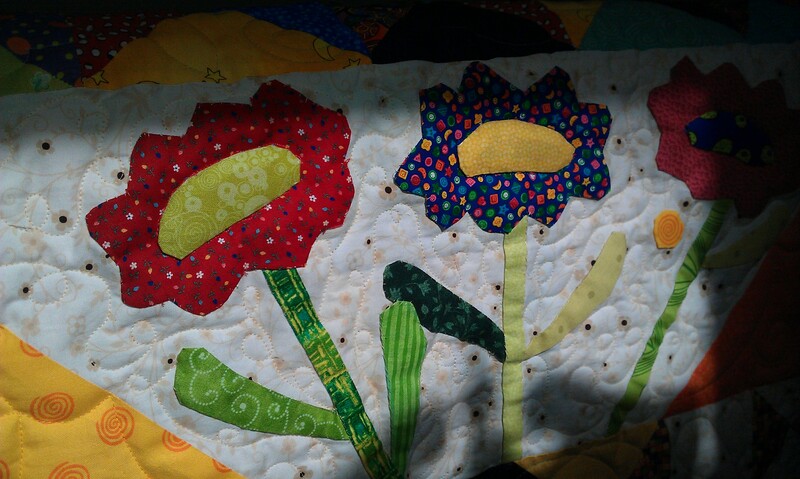 Freehand ‘loop-de-loops’ were quilted on the background fabric close to the edge and the flowers. ‘Stitch in the ditch’ application was done around the center of the flowers. These flowers were three dimensional. 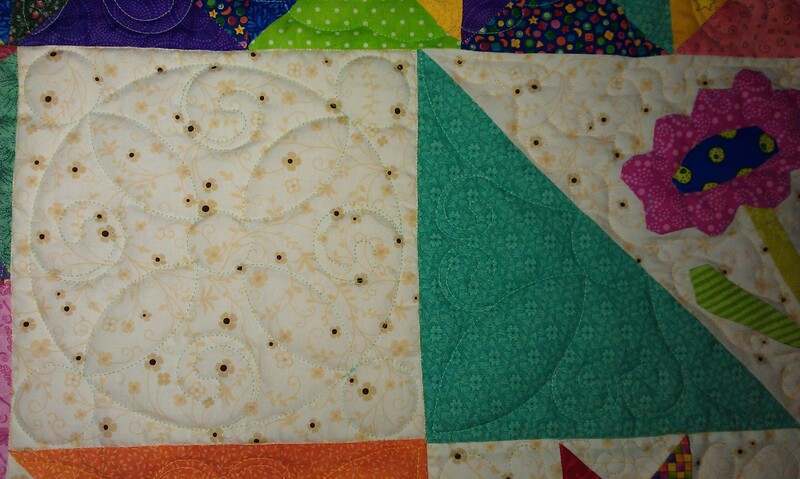 My customer creatively used blocks that were left over from the quilt top. She placed the strip of blocks between two lengths of fabric. I centered this strip of blocks on the back of the quilt. Samples of the back stitching tension. This was a FUN quilt to quilt and I was very HAPPY to quilt it! 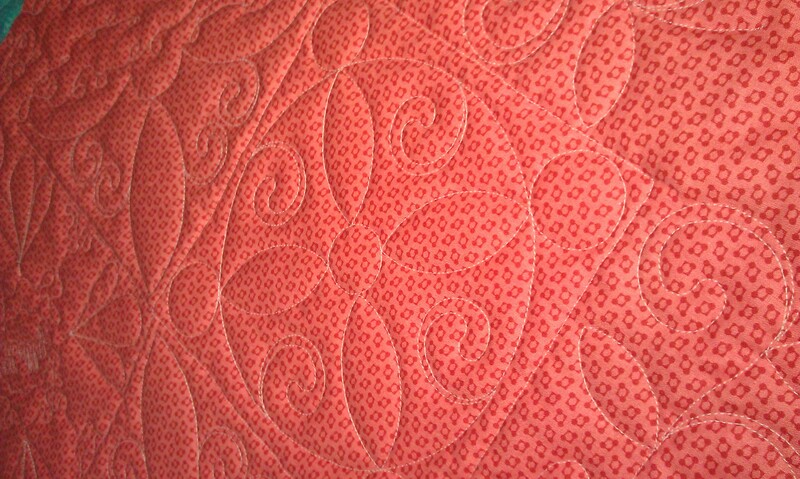 In the quilting world, Christmas will be here SOON!!! no matter what month it is! Please click HERE to schedule your quilt top quilting for holiday gifts!